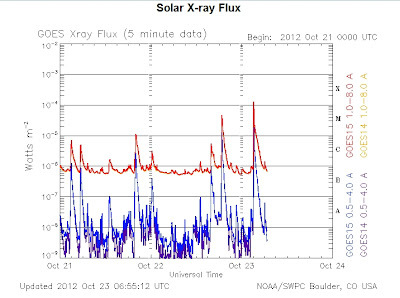 An impulsive, short-lived X1.8 solar flare from sunspot area AR1598 on the left side of the sun reached peak intensity at 03:17 UTC early on October 23, 2012 (11:17 PM EDT on October 22) [Update: Later reports from NASA gave 03:22 UTC as time of peak brightness]. X-class flares are considered the highest in intensity. 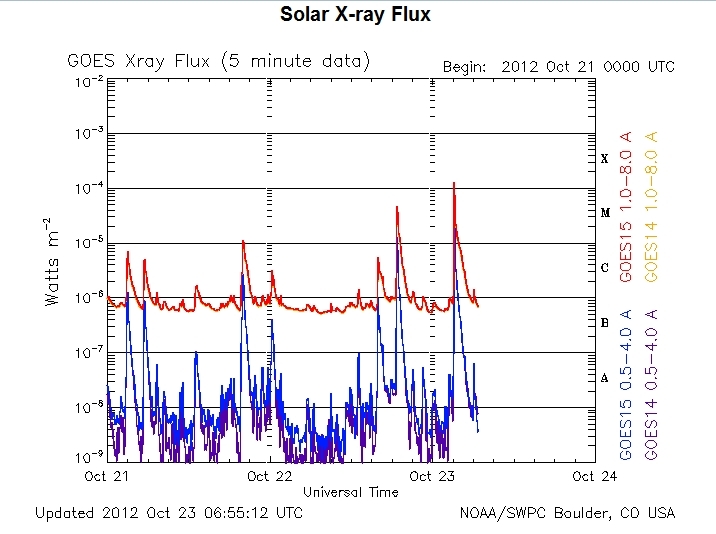 This particular flare had a brief duration and was on the lower end of the X-class scale. From the National Weather Service Space Weather Prediction Center report: "Impulsive flares aren’t generally associated with severe space weather, and additionally, this region is still several days away from directly facing Earth from center disk. Nonetheless, the potential for continued activity remains..."
SolarHam.com produced a video of the X1.8 solar flare based on NASA imagery. 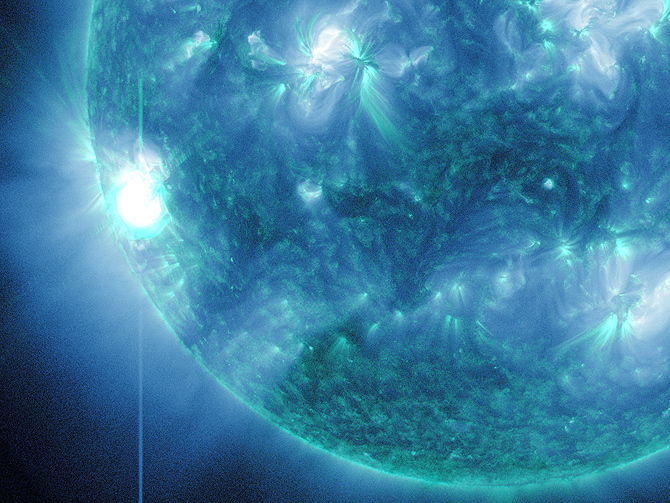 An earlier M5 flare on October 22 from the same active region peaked at 6:51 PM UTC (2:51 PM EDT). The M9 flare on October 20 also was emitted from active region AR 1598. This area is being carefully monitored for future flare activity. NASA reported on October 22 multiple slow coronal mass ejections (CMEs), but due to the active region's position on the sun, these were not headed towards Earth. 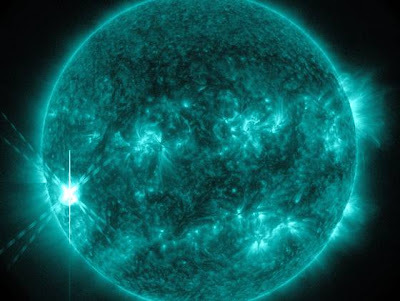 Early reports from non-NASA sites such as SolarHam.com suggest that the larger X1.8 flare will likely not produce a CME directed towards Earth. Stay tuned for future official reports from NASA on the latest flare. NASA/SDO this morning reports the time of "peak brightness" of the flare as 0322 UTC on October 23 (11:22 PM EDT on October 22). From the NASA/SDO mission blog: "This active region has produced quite a few flares since rotating into the view of SDO. With sunspot number currently at 86, perhaps even more active is at hand."